A man has died after the car he was driving came off the road and crashed in Monmouthshire. 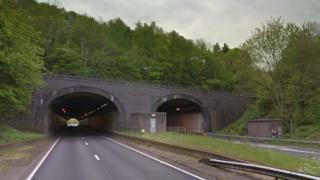 Gwent Police said the vehicle came off the southbound A40 between the Gibraltar tunnels and Dingestow at about 00:20 BST. The 57-year-old driver of the grey Range Rover died at the scene. The southbound carriageway remained closed between Cinderhill Street and Mitchel Troy for several hours after the crash.